CoilyQueens™ : Combine these two products and double your hair growth! Combine these two products and double your hair growth! I discovered Liquid Gold products 3 years ago. They offer a wide range of healthy hair products, but two of their products have become a staple in my hair regimen. 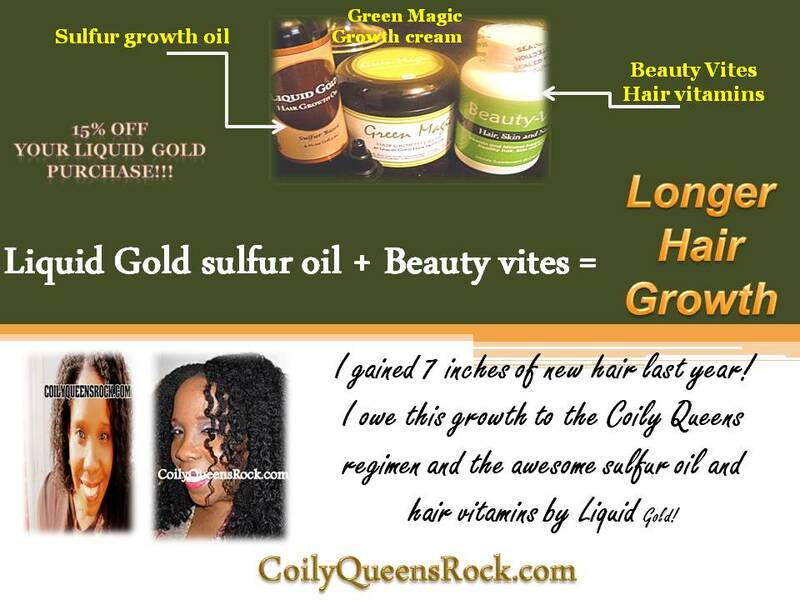 The Liquid Gold beauty vites hair vitamins and the Sulfur growth oil. The beauty vites are capsule vitamins you take twice a day. They contain almost the same vitamins and minerals as the hairfinity vitamins, but for half the price. You get a one months supply for less than $15. The sulfur growth oil is MSM sulfur infused in a blend of emu, grape seed and other awesome oils. I massage this oil onto my scalp 3 times a week. Combined with the beauty vites working from the inside out, I receive amazing growth each month. In addition to growth increase the sulfur oil treats itching, softens hair and gives it amazing sheen. Great price with great results! Add these two products to your healthy hair care regimen today. Look for great results in as little as 4 weeks. I recommend making a commitment of 3 to 6 months worth of products for best results. 3 months supply of Beauty Vites cost you $44.97 then subtract the 15% discount you pay around $40 for a 3 months supply. Does the oil effect henna/indigo colored hair? I am concerned about using oils that might make the indigo fade. I was told by one of the Mehandi.com reps that coconut oil, for instance, is not a good choice for hair colored with indigo. Thank you.